Today, we release our first update of the year — Vivaldi 2.3 — with a strong focus on making every part of the browser more useful for you. The update introduces a unique way to “auto-stack” tabs that streamline your workflow even more. We’ve also added new ways to access websites in the Address Field and made overall improvements to navigate and interact with the Web quicker. Read on for a rundown of what’s new! When it comes to managing your tabs, Vivaldi’s Tab Stacking stands out. It enables you to collect a group of tabs by dragging one tab over another. It’s a great way to keep your browser window tidy and helps you avoid the need to hunt through dozens of tiny tab titles to find the one you want. Depending on your workflow, you can create several Tabs Stacks and give each of them a name to help you identify them more easily, rather than relying on a small thumbnail image. Of course, you can also pin, drag, hibernate and mute tabs as needed. Vivaldi 2.3 introduces an intriguing way to ‘auto-stack’ related tabs into a Tab Stack. 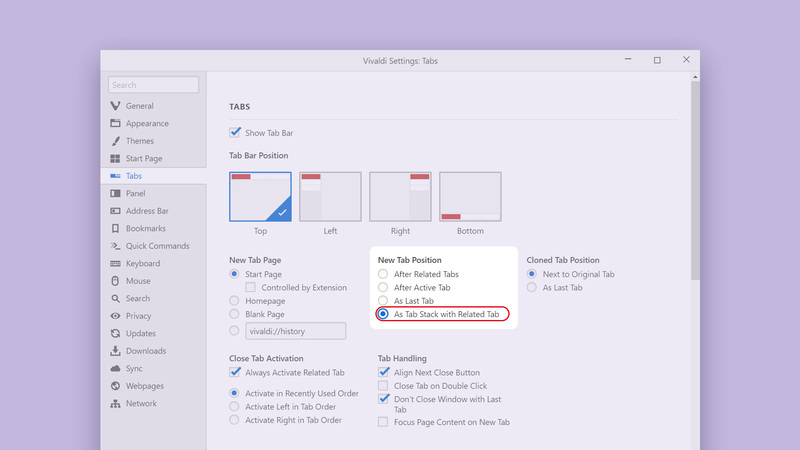 You can enable this feature in Settings → Tabs→ New Tab Position→ Select “As Tab Stack With Related Tabs”. With this setting enabled, when you open a link from the active tab, it is added to a Tab Stack. This automated way to keep your tabs organized is a fine example of how you can streamline an extraordinary amount of information while browsing. Do you want to know more about how auto-stacking came into existence? Read Exploit that bug: The untold story of Auto-Stacking. 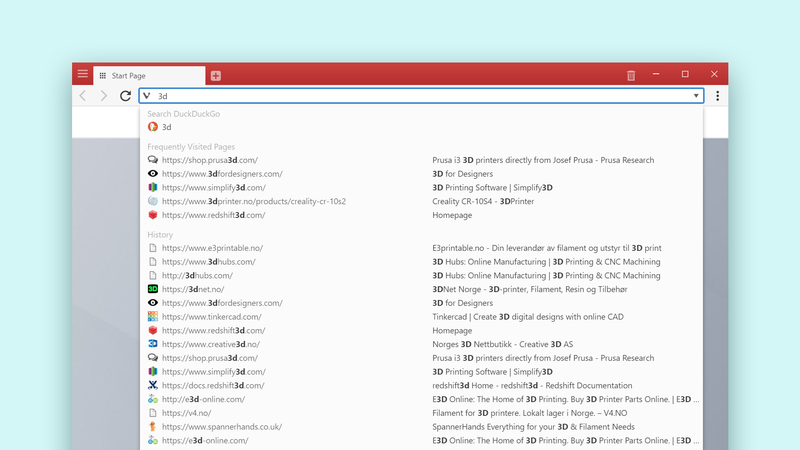 Vivaldi approaches the Address Field differently from other browsers where the list of sites and searches shown in the drop-down are often obscured with no context. In Vivaldi, you can decide what you want to see in this drop-down – you can mix and match what types of results are shown to fit your workflow and unique setup. Vivaldi’s Address Field gives you fine-grained control on how to get around the Web quicker with the help of the following categories in the drop-down such as Bookmarks, Typed History and Browsing History. In this update, you can now find Frequently Visited Pages — the pages you have visited most — in the drop-down. 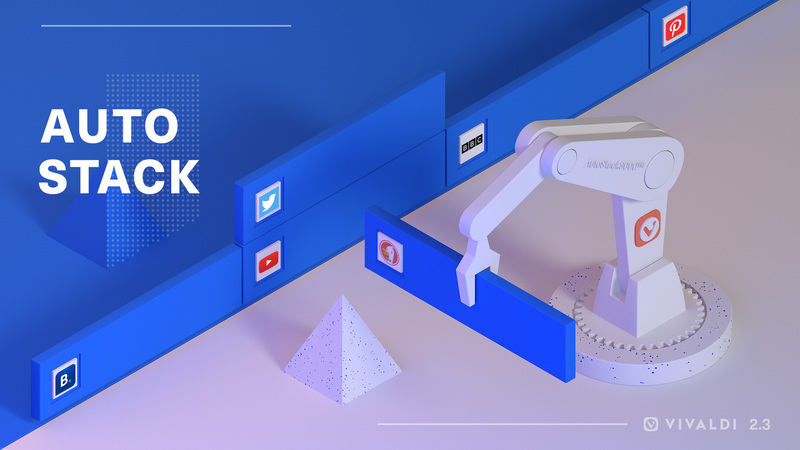 These site suggestions are based on your browsing habits and are also shown in other Vivaldi features as well, like Web Panels and Speed Dials. Off by default, this option can be enabled in the Settings. Simply go to Settings → Address bar → Address Field Drop-Down Menu → tick box for Frequently Visited Pages. Search Suggestions also let you find sites, but in this case, what you type is sent to your preferred engine. Often overlooked as a privacy issue, Vivaldi handles this uniquely – search suggestions are turned off by default and can be enabled per search engine. Vivaldi’s built-in Capture tool lets you capture any part of the Web in a screenshot. Images can either be copied to your clipboard or saved to your computer. Now, finding and sharing a specific screenshot is even quicker and more organised with the new default naming. Plus, you can pick and choose your preferred pattern/ format in the Settings → Webpages → Image Capture → Capture File Name Template. We’ll say, give it a (screen)shot! Very recently, we blew out candles for our 4th birthday while working to “kill all bugs”. So, here’s to another year — and continuing to build Vivaldi as a truly personal browser. In this update, we’ve tackled several bugs and regressions.To know more in detail, take a look at the Changelog below.